Henry’s subsequent offspring are all shown to have been born in New Shoreham which indicates that the family were first there in 1833 when the second child was born. The family lived at 46 High Street (of course, not numbered then) which he rented from Messrs Bradleys, next door to Miles Adams, his brother, who owned and occupied number 44 – Miles married Mary Egden and first appears at the latter address in 1831. By 1841 business was booming and Henry had taken on 16 year old Henry Diplock as an apprentice and 15 year old Fanny Parsons as a servant. Furthermore, he had also taken under his wing Egden Adams 12 now an orphan after both his parents (Miles and Mary) had died. Another orphan and presumably Egden’s brother, Thomas Adams was with Thomas Carver, a miller and his family in Buckingham Street. 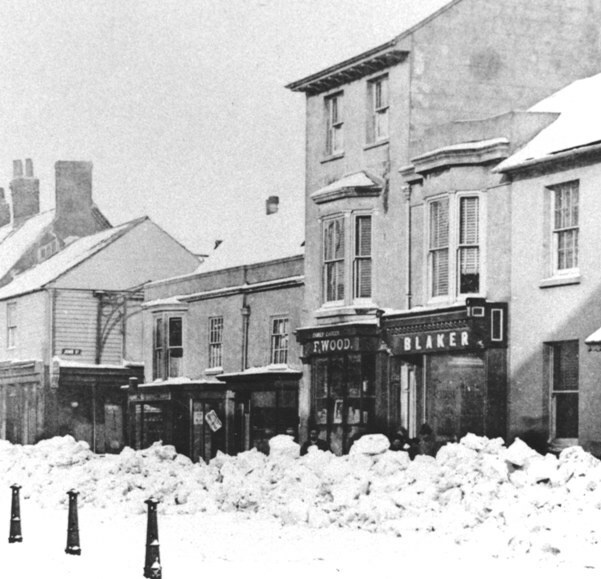 Detail from the High Street snow storm photo of 1881 showing the set-back buildings (no’s 48 to 52) that Henry started off with. By 1911 he owned all of numbers 46 to 52 but had let no.46 to his son-in-law Frederick Wood. It may sound uneconomical to imagine that corn was transported from Henry’s Plumpton farm bearing in mind the distance involved but using his own produce and possibly his own carts meant that he only had to bear the production costs. The journey may have been slow and ponderous but the 12 miles or so from Plumpton was nothing compared to the distances that dry cereals were even then transported all over the world. By 1841 Henry had purchased the mill in Mill Lane from H.C.Bridger and it was here he ground his grain for flour – he also built a large granary in John Street which still stands but even then still needed to rent the Marlipins to store his corn as well. Henry senior died at 8.15 am on the 16th February 1854 and Phoebe at 9.50 am on the 9th July 1858 so did not reach great ages being 55 and 50 respectively. Eldest son Henry junior, still single, inherited the business and kept the bakery going employing his brothers Amos and Gabriel with his sister Mary as housekeeper. Thirteen year old Ellen Clark was their domestic. The bakery business continued to thrive and having been enriched by the majority of his father’s estate Henry moved to Victoria Road , invested in the shipping business becoming a ship owner and purchased the neighbouring houses and shops from 46 High Street up to and including no.52 on the corner with John Street. 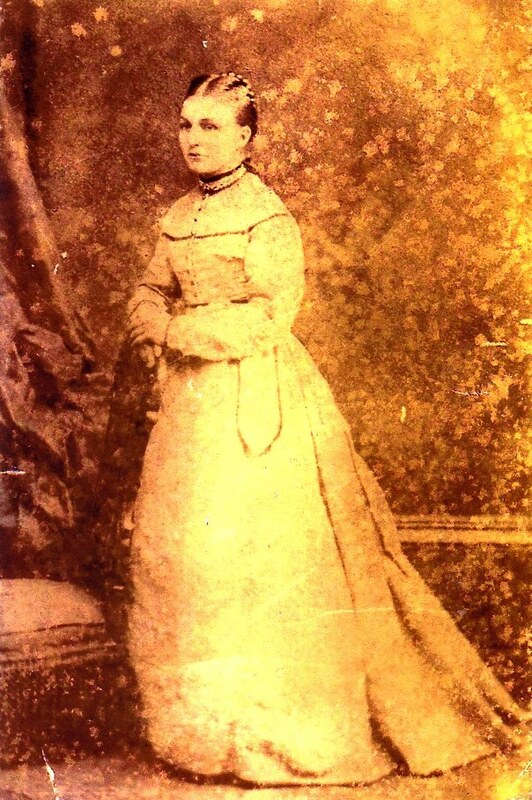 In 1880 at the age of 50, Henry married 24 year old Ada Gates from Brighton and in doing so not only gained a young wife but also married into what one of the largest ship owning families in the area. By coincidence their housekeeper was Mary Winton, sister of William Winton who was to become the celebrated organiser of Shoreham’s regattas and carnivals. “A fatal collision occurred off Shields on Wednesday 5th April 1865. About midnight the ‘Hedley Vicars,’ brig of Shoreham laden with coals homeward bound, was proceeding down the Tyne in tow of the steam tug ‘J.P.Almond’ when about a mile ahead a steamer was seen approaching from the sea. The helms of the tug and the ‘Hedley Vicars’ were ported and the steamer hailed to alter her course. Although every effort to avoid a collision was made by the ‘Hedley Vicars’ the screw of the steamer which proved to be the ‘Berwick’ and which was under full steam, struck her with a tremendous blow on the port bow cutting the vessel down to the waters edge. The damage was so extensive that the brig immediately began to sink and a few minutes after the collision went down. The crew, with the exception of a lad who was in the cabin, escaped. The latter, a youth of about nineteen belonging to London, went down into the forecastle to get a drink just before the collision and it is probable that when the screw struck the brig he was killed; the crew called to him to come up but no answer was returned. The remainder of the crew landed at Shields and on the application of the master of the ‘Hedley Vicars’ the Tyne Commissioners’ diver went down and recovered about £8 and a quantity of clothing. The diver reported that the decks were breaking up and the port bow nearly out but he could discover nothing of the youth that was missing. At the time of the disaster the captain’s dog was in the jolly boat on the deck and when the ship sank the boat floated away with the dog in it. The animal was rescued by his master and the boat secured and taken ashore. Henry was now in partnership with the big business names of the town;- The Englishes ran the rope and sail making business in West Street and William Horrocks was another ship owner who lived at the house now numbered 28 Church Street. Amos was of course Henry’s brother. In 1891 the family were still in Victoria Road and Henry appears as a full of vitality 61 year old father of children Henry John 9, Charles 8, William 4, Ada 2, and Ernest 7months. Two more children, Reginald and Frederick followed before they all moved in 1900 to a new house next to their mill in Mill Lane. One of a pair of semi-detached houses, Mill House was especially commisioned to be built for him and the original coloured architect’s drawings still exist in Adur Council’s Planning Department along with a plan of the houses and the windmill next door. Henry eventually died on 14th October 1916 at the good age of 86 and is buried in the New Shoreham Municipal Cemetery. His wife Ada also enjoyed a long life and died at the age 87 at Mill House in 1944. Top Left: Detail from the 1907 Shoreham sports day which Henry and his family probably watched. Mill House can just be seen to the right of the mill. Right: Mill House today. Below Left: The recently uncovered house name. Back to 1861– brother John is next door to 46 High Street with his wife Mary Ann as a Master Tailor employing two men and cousin Egden (the orphan) now married to Amelia is in 1, East Street, on the south-west corner with the High Street, as a Master Baker in his own right. They remained here until the 1880’s but never seemed to have any children. Egden’s bakery, next to the Ferry Arms pub, had two fronts, one for the door on the High Street and the other in East Street. It was later absorbed into the pub itself and the old shop front removed during the 20th century sometime after 1921. 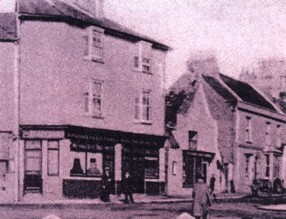 Egden Adams’ bakery in East Street was the shop on the left. It has since been absorbed into the Ferry Arms which at the time of this photo was on the right hand side of the building. Their house, owned by Henry, adjoined the front of the large granary store previously mentioned which Henry had built and which still stands on the south side of the pathway that runs alongside the Baptist Chapel where the garages are now. The 1871 census shows Amos Adams is now living at 72 High Street with, and working for, his brother in law Frederick Wood and his wife Mary, Amos’ sister. 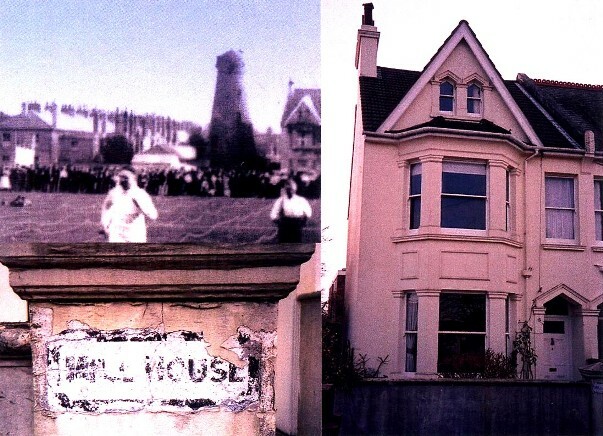 Frederick, then a baker, later turned his hand to run an apparently successful contractor and haulier’s business and remained in that house until his death in 1929. Amos returned the compliment and himself married Wood’s sister and lived for a while with Frederick at his house in the High Street. 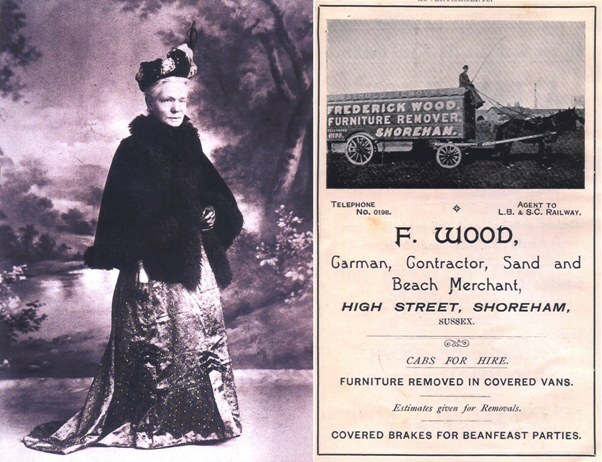 Left: Mary Jane Wood, nee Adams Right: An advertisement for her husband Frederick Wood’s business that includes a photo of what is believed to be Frederick perched precariously on one of his wagons. Sadly, William died some eight years later of ‘epilepsy coma’ at the relatively young age of 44 at the Union Workhouse on the 27th April 1879. This does not necessarily mean that William had been there some time as an inmate as workhouses then were for most the only means of medical care. As an ongoing development of this service most workhouses throughout the country evolved into hospitals by the 1930’s. However, perhaps as a consequence by 1881 his wife Elizabeth moved with her offspring to the Lower Road (now Brighton Road) on the river front. This was a small collection of what appears to be poorer houses just round the corner from East Street where the garage now stands that have since been demolished for road widening. George had become a postman by 1891 but yearned for a better life and after marrying Ellen Rhoades from Buckingham Road is believed to have emigrated to New Zealand taking his wife and mother with him. William’s daughter Laura first worked as a general servant for the Hedgthorne family at 27, Church Street. The poor girl was only thirteen and although that was not so unusual for the time it emphasises an entirely different way of life then when children had to grow up early. 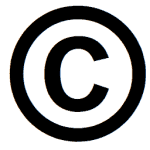 James Hedgthorne was an oyster merchant from Brightlingsea. Laura continued her domestic work during her teenage years and as she grew up would have realised that marriage was the only hope of escape from a life of drudgery in servitude. Her hopes for a better life looked brighter when she met and married William Finch who later became head attendant for the somewhat tactlessly titled ‘Metropolitan District Asylum for Imbeciles’ at Caterham in Surrey. One of their subsequent offspring was later to return to the area setting up a successful laundry business at nearby Portslade in the 1920’s.